A mammoth cloud half the size of the contiguous United States and spotted on Saturn's moon Titan might be what's filling up lakes discovered there last year, scientists say. "This cloud system may be a key element in the global formation of organics and their interactions with the surface," said study team member Christophe Sotin of the University of Nantes, France. Imaged by NASA's Cassini spacecraft on Dec. 29, 2006, the cloud [image] is about 1,500 miles (2,400 km) in diameter and engulfs Titan's entire north pole. It only recently became visible, emerging from a shadow as winter turns to spring on the moon. Unlike Earth's clouds, which contain mostly water vapor, the Titan clouds are thought to consist of ethane, methane and other organics. Scientists had predicted the existence of such a cloud system, but one had never been imaged in such detail before. Cassini spotted partially filled lakes on Titan's north pole last summer. Scientists speculated that methane rains down onto the moon's surface to form lakes and then evaporates to form clouds, in what they called the "methane-ologic cycle." The new finding supports this idea. 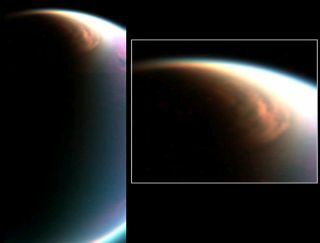 Ground-based observations show the Titan cloud system comes and goes with the seasons. A season on the Saturn moon is equivalent to about seven Earth years. Scientists speculate such cloud activity can last for as long as 25 Earth years before nearly vanishing for four to five years and then reappearing for another 25 years. The same cloud system observed last December was still there two weeks later during a Jan. 13, 2007, flyby. Scientists expect the newly spotted cloud to linger for several years, possibly shifting down to Titan's south pole as the seasons change. "With 16 more flybys to come this year," said study team member Stephane Le Mouelic, also of the University of Nantes, "we should have the opportunity to monitor the evolution of this cloud system over time."